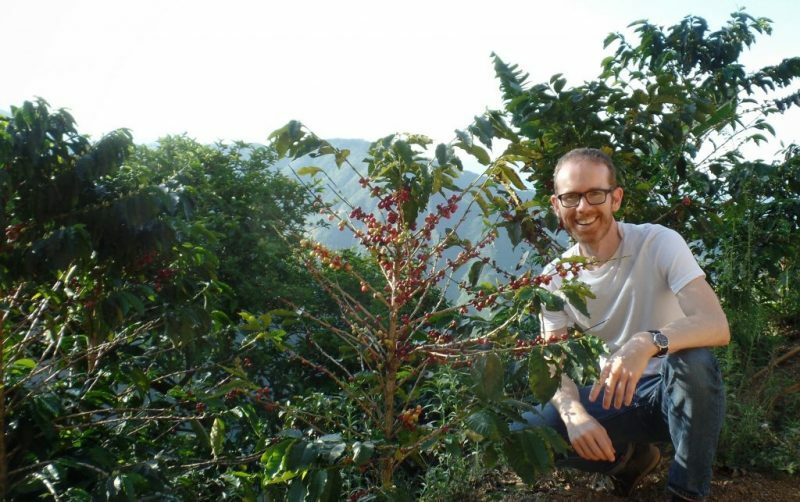 Five years ago, Jason Bennett never would have envisioned himself embarking on new career path, jet-setting around the world, and consulting for a Colombian coffee startup. A marketing professional by trade, after 15 years in the corporate world, Jason felt it was time for a new challenge. Deciding a departure was in order, he did what any travel-inclined, entrepreneurial former 9 to 5-er might do: started his own marketing company and hopped on a plane to Lisbon, Portugal for a much-needed change of scenery. Not stopping there, Jason wanted to bring his skills to bear on a more socially-impactful project, and ultimately found himself in Medellin, Colombia. Spending six weeks in the world’s most innovative city of 2013, he worked with a MovingWorlds partner, The Coffee Quest, an environmentally-minded local coffee exporter, to develop their brand and launch it in the United States. To give some quick context, The Coffee Quest is the only coffee company with their entire supply chain located in the country. Their coffee actually only comes from farmers they know personally, and on any given day, they are in a car (or on a mule!) visiting them. The beans are milled, roasted, and packaged locally too, which creates jobs and opportunities. This also reduces their environmental footprint and supports the health of the planet, a passion shared by the farmers they do business with. What did you do on your project? Over six weeks I helped The Coffee Quest define their brand and develop a United States launch plan. I was really inspired by their commitment to not only source Colombia’s best beans, but do so in a sustainable way, such as paying fair wages and keeping the entire production cycle (i.e. picking, processing, roasting, packaging) in the country. Once the brand platform was complete, I rewrote their website content to reflect their incredible story, while concurrently conducting market research for their impending United States launch. After identifying cities with the right demographics, I put together a profile for each one with key influencers and potential distribution targets, as well as national publications that can help extend their reach and establish credibility. What was one thing you wish you knew before you went? What advice do you have to people thinking about doing this program? Have an open mind, and trust the human intent on what the outcome will look like for these projects. Be confident with what you have to offer! Also, this was a great opportunity for my business, True Star Consulting! I developed many unanticipated relationships, including networking with a flower farm specializing in U.S. exports as well as a local publishing house, both of which were looking for branding help. This project opened other doors that were invaluable. Only the best of coffee beans make the cut! Do you still keep in contact with your host? Yes, I consider him a friend now! We remain in contact, and I am hopeful that as The Coffee Quest grows there will be opportunities to work together again in the future. Why do you see something like this as important, and do you feel like you made an impact? Absolutely! I felt like an impact was made, definitely. I left corporate America for opportunities like this — ones where I felt there was a deeper purpose and impact being made– and I feel very proud of my personal and professional contributions, both to The Coffee Quest and the incredible country of Colombia. Throughout this entire experience, I developed so many authentic relationships that I will carry with me. And knowing that I helped the host shift his marketing mindset, in addition to connecting him with a huge other network that he hadn’t engaged with before, has the long-term potential of ensuring they keep growing on their own is absolutely priceless. The U.S. was completely a new frontier for his business, and it would’ve taken several rounds of costly trial and error, based upon his original plans, in order to zero in on the venue for his coffee sales. I was able to provide him with this vantage point in order to have a clearer picture for his expansion plans. I was excited that we even finished with all the deliverables early! It served as a big source of motivation to get his product and distribution in place. I saw that he was visibly more excited about the opportunity of expanding into this new territory, which was such a cool feeling to leave someone. You can read more about Jason’s story on his blog post here. Interested in exploring a path like Jason’s? See current projects in Colombia, other marketing projects, and then pick a membership plan for help sourcing one that’s right for you!